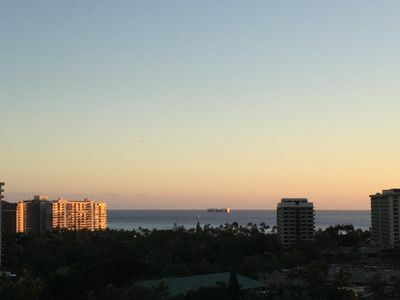 to our privately owned condo, located on 18th floor @ Royal Garden a 'Euro- boutique' Hotel, considered to be the one of the most elegant buildings in Waikiki. It’s called a 'LITTLE JEWEL' by many. 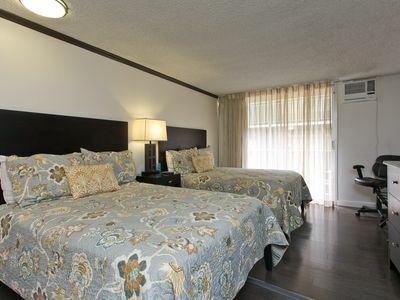 Hotel is combination of Wyndham Vacation Resort and privately owned units. It is rated as 4* hotel. Excellent, nice & quiet, less traffic noise location and yet just short walk to buses and trolleys. 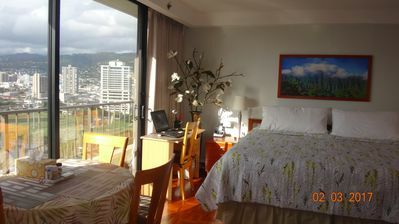 Very close to Ala Moana shopping Centre, Convention Centre, Downtown Honolulu, Chinatown, Aloha Tower and University. 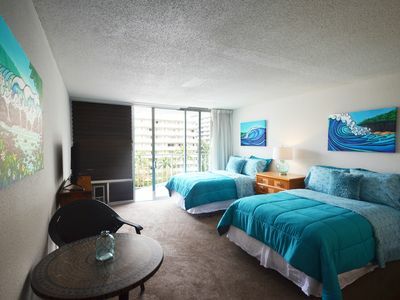 Walking distance to many ABC stores, Waikiki and Royal Hawaiian Shopping Centre, restaurants, nightlife and beaches. De Russy is beautiful, not crowded beach, only 10 minutes easy walk through the Fort de Russy Park. There is also the Fort de Russy Chapel for those, who would like to attend Sunday morning service. 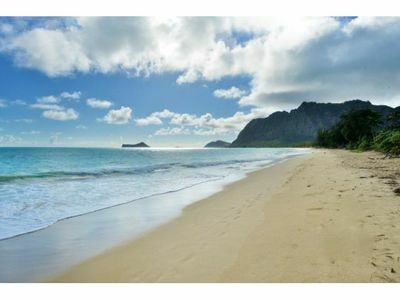 Grass or sandy beach, your choice, many palm trees for shade, picnic tables, BBQs, racquetball, volleyball, tennis courts and showers on each end of the beach. 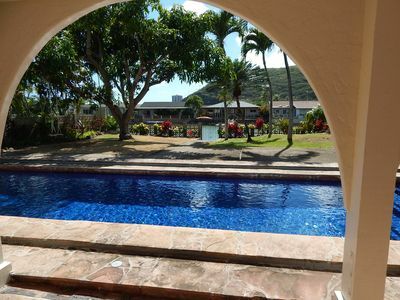 A handy snack bar at Hale Koa Hotel, clean washrooms beside with changing stalls and foot washer are accessible right off the beach. It has very Friday nights fireworks view display by Hilton Hotel. 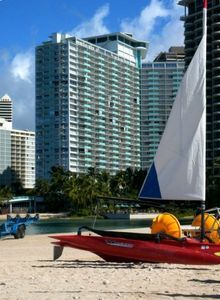 It has view of Ala Wai Canal and sport's fields to watch games and canoe races. It has also beautiful City and Mountain views with rainbow displayed after the rain. EXTRA LARGE unit was completely renovated. It has hard wood floor and it is furnished with brand new furniture. Very comfortable King size bed with 'Ara 13' King Memory Foam Mattress 100% Visco , full size Micro fibre sofa-bed, dining table for four, plenty of dresser storage, 40" Full HD TV, Time Warner Cable, DVD Player, games, Stereo with CD and Radio/Clock. Unit has FULLY FUNCTIONAL KITCHEN with 20” RANGE with four burners and oven, microwave, two refrigerators, one with large freezer section, toaster oven, toaster, coffee maker, coffee grinder, rice & slow cooker. All dishes, utensils and cookware are provided. Just everything you need to have a choice to prepare some of your favourite meals or snacks at home. There is also ironing board and a iron for your convenience. Spare linen are provided. Bathroom is all marble with shower over tub and hair dryer. 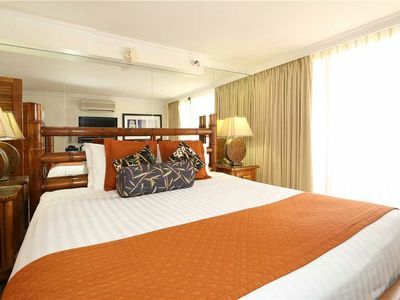 FREE, secured WiFi Internet connection on the room, telephone with AM, FREE local calls included. Also FREE WiFi is throughout the building. Brand new, very quiet Mitsubishi remote control SPLIT Air Conditioner system and a fan for those who don’t like to have air conditioner on. 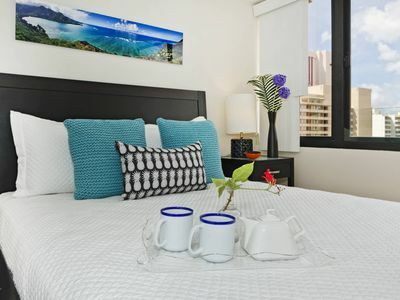 FREE spacious 6 washers and 10 dryers laundry facility for properly registered guests with coin operated detergent dispenser and Cold drinks machine. FREE new FITNESS/GYM Centre, 24-hour manned security and friendliest helpful staff you will ever meet. 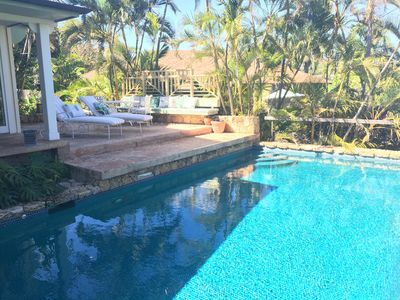 The common areas of Royal Garden are beautifully decorated with Italian granite, a pleasant garden-style outdoor pool, 2 Saunas with showers, 2 BBQs, tables, Ice and cold drinks machine and Media room. 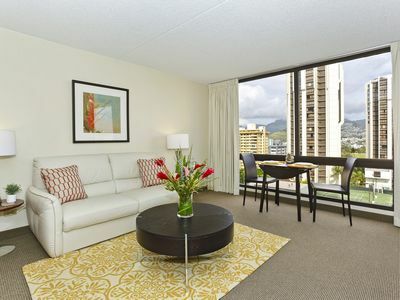 The Royal Garden at Waikiki is a NON-SMOKING & NO PETS allowed building. This is a strict policy and fines are issued for violations. Covered parking in the building is hotel's parking and a fee is $30/24 hours. It needs to be arranged with Hotel personnel (Front Desk) upon arrival. Other underground parking is just a half a block from our hotel and fee is $20/24 hours. Free parking on Ala Vai from 6pm -7am & all day on Sunday. Metered parking is also available on Olohana street. But remember; there is an excellent bus service on the Island of Oahu. No need to rent a car unless you absolutely wish to do. 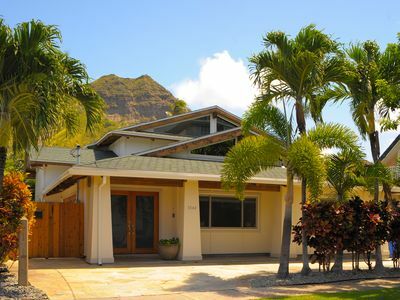 This rental will give you a spotless clean, roomy and very comfortable place with homey feeling and exceptional value. No need to stay in a 'budget' hotel room. Please, read our Rate Policy carefully before inquiring. Thank you. Can you see yourself enjoying endless ocean views with your coffee or cocktail? 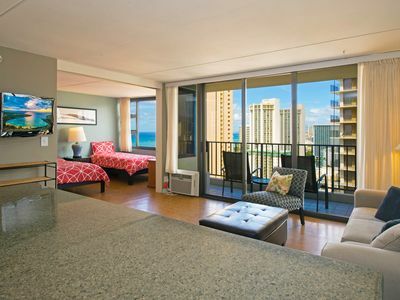 Luxury Beachfront Condo with Amazing Views, You will love it!